Perched on the mezzanine level just above the lobby of the posh Kitano hotel on Park at 38th Street is a music room of extraordinary intimacy. Affectionately known as Gino’s living room, promoter Gino Moratti has been bringing top-notch jazz to the Kitano since 2006. On Friday November 18th the venue featured two sets of solo piano by the superlative pianist Denny Zeiltin, featuring songs from his recent cd "Labyrinth"
Matt Wilson on drums. I was fortunate enough to be able to catch most of the first set and all of the second set Saturday. It is rare to get to see Mr.Zeitlin in New York as he resides in California where this Renaissance man practices psychiatry and teaches at the University of California in San Franciso. The superlative rhythm section of Williams and Wilson is no stranger to Zeitlin. 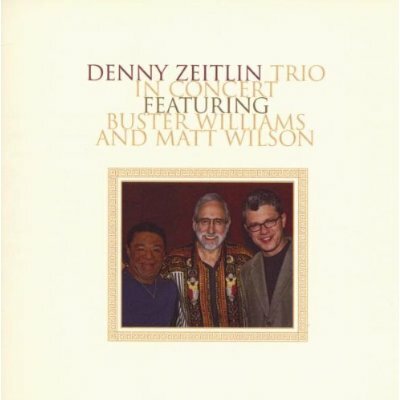 The three have been playing on and off for ten years and Zeitlin’s 2009 Sunnyside release “Trio in Concert” is a testament to their obvious chemistry. If the way a working trio functions is in some respects analogous to the way we function in life,then Zeitlin is the cerebral mind, Wilson is the joyful spirit and Williams is the pulsing heartbeat and soul of this entity. Each is a virtuoso in his own right and they all have characteristics that blur such simplistic boundaries. The first set included a tender ballad “Wishing on the Moon”, a Zeitlin composition, that featured the pianist’s deeply probing technique. Zeitlin can take you from sensitive passages that he renders with a gossamer touch to daring explorations that bring you to the brink of precipice, without ever letting you fall over the edge. A rousing rendition of John Coltrane’s homage to bassist Paul Chambers “Mr.P.C.” had Zeitlin’s playing arpeggios at dazzling speed. The song featured the bass of Buster Williams who produced a simply gorgeous tone that resonated through the entire room tantamount to the peaceful solemnity of a Tibetian gong. Mr.Williams is a master of his instrument who can add great poignancy by simply bending or sliding down to his notes and sustaining them as they decay to silence. Drummer Wilson is astutely attune to the needs of the music as he seamlessly changes from brushes to sticks, from clashing hi hat, to shimmering cymbal. Another Zeitlin composition “The We of Us” was written for the pianist’s wife. Here Zeitlin demonstrates an extraordinary ability to play on the highest register with crystal clarity of sound and precise intonation. 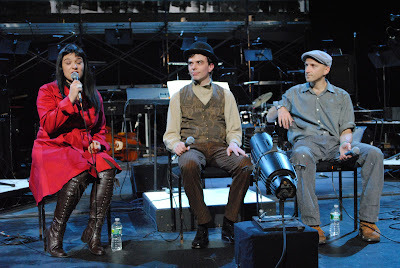 The trio does an amazingly dynamic version of Julie Styne’s “As Long as There is Music”. The intuitive interplay is a marvel to behold as the group collectively create a swell of intensity that has the crowd mesmerized, eventually yielding to a fading coda that is accentuated by Buster’s lingering bass line. As if being a world class jazz pianist and working psychiatrist and educator weren't enough, Zeitlin is also an avid mountain biker. He spoke of Moab, Utah as the inspiration of his next composition titled “Slick Rock”. This composition is by far the most unorthodox of the repertoire. 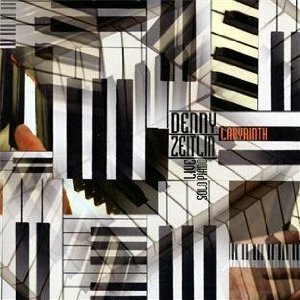 Here the pianist and his cohorts create an array of atmospheric sounds as Zeitlin reaches into the cavity of the piano using mallets to play the strings. Mr. Williams rubs the side of his thumb against his bass strings adding tension to the eerie sound as Mr. Wilson adds further agitation by using apiece of chain to rub against his cymbal. The audience is lulled into the peaceful solitude of the surroundings when suddenly Zeitlin hurls them into a spiraling musical journey filled with frantic twists and turns. You can feel the imaginary bike careening down jagged hills, precariously avoiding boulders and divots in a pianistic free fall. The pace subsides as Zeitlin becomes more ruminative; Wilson employs a weirdly eerie wooden flute that he somehow uses against his the face of his drumhead and Williams bows in decidedly ominous way. Watching Wilson here I am reminded of an excitable young boy with a chest full of wonderful toys. The drummer has an effervescent joyfulness that is palpable and he finds percussive magic in a variety of unorthodox devices which he skillfully weaves into patterns of dynamic tension and surprise. I was watching Zeitlin and Williams looking at Wilson at various times during his solo on this piece and I was reminded of a You Tube that I saw of a beaming Charlie Parker watching an equally playful young Buddy Rich, as the drummer displayed his rhythmic prowess (click here for that video). Wilson is that good! The second set started off with the “The Night Has 1000/10000 Eyes”. Bassist Williams creates a funky vamp that has the whole audience bobbing their heads.Buster can create a mood that few bassists can summon so successfully. Zeitlin inspired by the heartbeat-like rhythm lets loose with some of his most free flowing playing of the night. The trio played a charming version of what sounded like the “Child's Play”, a double time version of Sonny Rollins "Oleo" based loosely on the changes of Gershwin’s “I Got Rhythm”, Cole Porter’s “I Love You” and Jimmy Van Heusen's “I Could Have Told You”. The set ended with bassist Dave Freisen’s composition “Signs and Wonders” and after a rousing ovation the encore was Zeitlin's own “Just Passing By”. For lovers of piano jazz trios it was one of those very special evenings. Zeitlin is an innovator par excel lance with few peers. His trio with the great Buster Williams and the exciting Matt Wilson is one of the finest trios working in jazz today. and the Graphic Artist Danijel Zezelj. The Borough of Brooklyn has become a melting pot of all things artistic. My son, a twenty-five year old writer/editor, has made Brooklyn his adopted home. He was marveling recently that so many modern day masters of contemporary writing, regularly give readings of their work around town. I often find myself reviewing music of inspiring depth and boundless energy emanating from a variety of great musicians living and recording in Brooklyn. Consequently their is a "live" music scene in many parts of the Borough. A friend's son produces meticulously crafted, industrial design inspired furniture and sculpture somewhere in a converted factory in Red Hook. These are but a few examples of the artistic vibrancy of this city. Perhaps it is the relative affordability that draws economically challenged artists, but I suspect it is also a sense of community that is Brooklyn that fosters and nourishes a collective artistic soul that is drawn to this Borough in the shadow of New York City. Brooklyn Academy of Music for its 2011 Next Wave Festival. 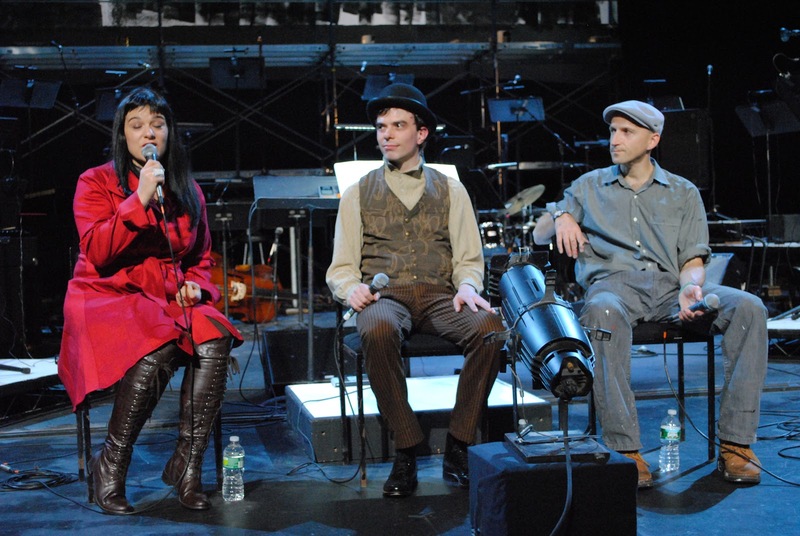 Darcy James Argue’s carefully orchestrated musical score to tell the story of the not so mythical Brooklyn Babylon. The story unfolds with Lev, an immigrant master carpenter who creates beautiful carousels that feature his masterfully carved animals. Lev unexpectedly finds himself realizing the dream of having his work recognized,in this case by city officials, as he is chosen to build a carousel to top off a colossal new tower planned to be built in downtown. The tower has its supporters and its detractors as this modern day edifice has the prospect of turning Brooklyn into a Metropolis.The implicit growth that comes with such ambitious expansion plans threatens to undermine the precious close-knit neighborhood feeling, the very soul of the community that has nurtured Lev's own artistic development. The story unfolds right before your eyes as Mr. Zezelj’s sweeping animation is flashed across a large screen behind the orchestra. Bold streaks of black and white form, graphic comic-like images of a bustling neighborhood. Part Fritz Lang's "Metropolis" and part Bob Kane's "Gotham", Zelzelj's images are modern and yet nostalgic. We see the growing tower and the ominous shadow that it casts on the surrounding neighborhoods. As Lev builds his beautiful carousel, he questions his own involvement in the project. As these scenes unfold overhead,Mr. 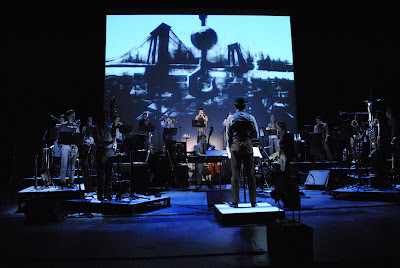 Argue’s Secret Society Orchestra creates the sounds that breathes life into Mr.Zezelj's images. To add to the spontaneity of the experience there is a scaffold set above the orchestra, just below the animation screen, where Mr.Zezelj, using rollers and brushes, creates a continuously changing scene in a dazzling exhibit of “live” painting. 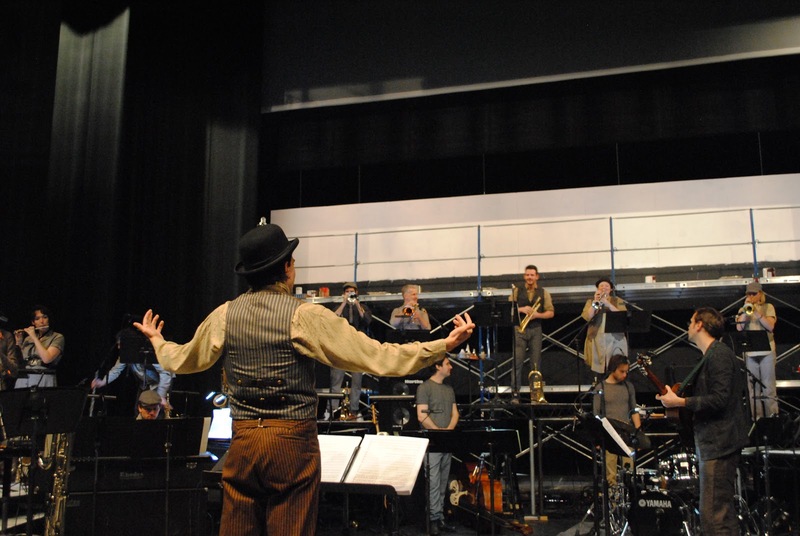 Mr. Argue’s orchestra is a eighteen-piece marvel of multi-instrumental versatility. Theatrically having his musicians entering the stage from all directions, he abandons the regimentation of seating all the brass in one line and all the reeds in another. Mr. Argue’s set-up spreads the stage of the Performing Arts theater with a semi-circular array of musicians who remain standing in working class attire throughout.The experience creates a wonderful sense of immersion with visual and audible sensory stimulation working in tandem to help present the story. There is a marvelous sense of involvement in the creative process as you see the musicians change instruments to create the precise sound Mr.Argue has orchestrated. “Brooklyn Babylon”. Using Mr.Zezelj’s animation and sketches Mr. Argue composed this compelling piece of music to help tell the story. Mr. Argue chose a team of dedicated and talented musicians to make this demanding project work. It is their collective voice that allows him the flexibility to create the multi-phonic textures so critical to his work. Mr. Argue employed sounds seldom heard together but perfectly suited to his purpose. Whether it was the euphonium of Mr. Fahie, the contra bass clarinet of Mr. Sinton, the piccolo of Mr.Von Kleist, the melodica of Mr. Webster, the acoustic guitar or Mr. Noelle, the gutsy tenor of John Ellis or the soaring trumpet of Ingrid Jensen to name a few, the music is awash in sounds that are carefully crafted to produce the desired effects in perfect concert with Mr. Zezelj’s fleeting images. The result is a dramatic piece of music that tells a story that is near and dear to the artistic hearts of Mr. Argue, Mr. Zezelj and I suspect many of the musicians who give it life. A story about the vulnerability of fragile, artistically friendly neighborhoods that are the creative lifeblood of the artists who live there. It deals with the conflicts that come from wanting to have your art accepted and being able to enjoy the fruits of your labor, while at the same time retaining your artistic integrity. The end result is an impressive narrative that offers visual splendor and musical majesty of the type not often experienced, a tour de force.Mr.Zezelj's "live" painting gives the performance a kinetic quality that keeps you engaged. At the end of the performance Mr.Zezelj blackens out his own creation- a final demonstration of the impermanence of art and metaphorically of the fragility of his precious Brooklyn neighborhoods. Having in recent months seen three vastly different large ensembles - The Christian McBride Big Band, The Westchester Jazz Orchestra and now the Secret Society- it is safe to say that large ensemble composition, orchestration and arrangement are all having a welcome resurgence. The expanded palette of colors that can be used with a big band is only limited by the creative mind of the composer. After his auspicious debut album"Infernal Machines" from 2009 and now with "Brooklyn Babylon," Mr.Argue proves that he is a fertile force indeed. James Hirschfeld, trombone tuba; Jennifer Wharton, bass trombone, tuba; Sebastian Noelle, acoustic and electric guitar; Gordon Webster piano, electric piano, melodica; Matt Clohesy, contrabass, electric bass; Shawn Baltazor, drums and percussion.